The decision to get divorced is not always an easy one to make and going through a divorce – also referred to as a dissolution of marriage – can be a painful and trying time in one’s life and the lives of their loved ones. A person considering divorce, or already going through a divorce, needs an experienced divorce attorney on their side. For some, a divorce is not always the best option and a legal separation may be the more appropriate route. To learn more about legal separation in Oklahoma, go here. When can a person file for divorce in Oklahoma? A person can file for divorce in Oklahoma when at least one spouse has been a resident of the State of Oklahoma for at least six (6) months. A divorce is commenced by filing what is called a petition in the county courthouse located in the county in which one spouse has resided for at least thirty (30) days prior to the filing. Every divorce case is different and the time it takes for the divorce to be finalized depends on a multitude of factors. It is possible for spouses, without children, who agree completely on all terms of their divorce, to have their divorce finalized in approximately two weeks. If there are minor children of the marriage, Oklahoma law requires that at least ninety (90) days must pass from the day the petition is filed, and, both parents must attend an educational program concerning the impact of separate parenting and co-parenting on children, the implications for visitation and conflict management, development of children, separate financial responsibility for children and such other instruction as deemed necessary by the court. In the event a divorce is highly contested, meaning there are little or no agreements, the process can last months, or even years. Is there any help while the divorce is pending? In a divorce where it appears that swift settlement is not possible, either party may apply to the court for temporary orders to remain in effect until a final decree is entered. These temporary orders may include temporary child custody and visitation, child support, spousal support, temporary division of property and debts, and even payment of temporary attorney fees. What about after the divorce? Can I marry someone else right away? What if we decide we no longer want to be divorced? Once a divorce is granted the parties are prohibited from marrying another person in the State of Oklahoma for a period of six (6) months from the time the decree is entered. If the parties to a divorce later reconcile they can petition the court to vacate the divorce decree or marry each other once again. Whether it is a simple uncontested divorce, or a full-blown, highly-contested trial, at The Crosthwait Law Firm, our team of experienced, compassionate and reliable divorce lawyers will work with you to ensure that you understand the divorce process, from beginning to end. 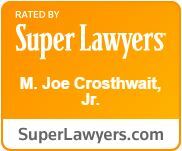 Our team of family law attorneys have over 40 years of experience representing people in and around the Oklahoma City, and will competently advise you and aggressively represent your rights in equitably dividing marital property, debts and retirement accounts, establishing child custody, visitation and child support, and evaluating the need for, or exposure to, payment of spousal support or alimony, following the termination of the marriage.